Step 1. To make a satay sauce, place coconut milk, peanut butter, sugar, garlic, sweet chilli, ginger and soy in a saucepan over low heat, stirring for 1 minute or until peanut butter melts. Bring to a simmer and cook for 5-6 minutes, stirring, until thickened. Stir in lime juice and set aside to cool. Step 2. Place mince, onion, crumbs, chopped coriander and 1/2 cup of the satay sauce in a bowl and combine well. Form into 4 patties and chill for 15 minutes. Heat 1cm oil in a frypan over medium low heat and cook patties for 3-4 minutes each side or until cooked through. Step 3. 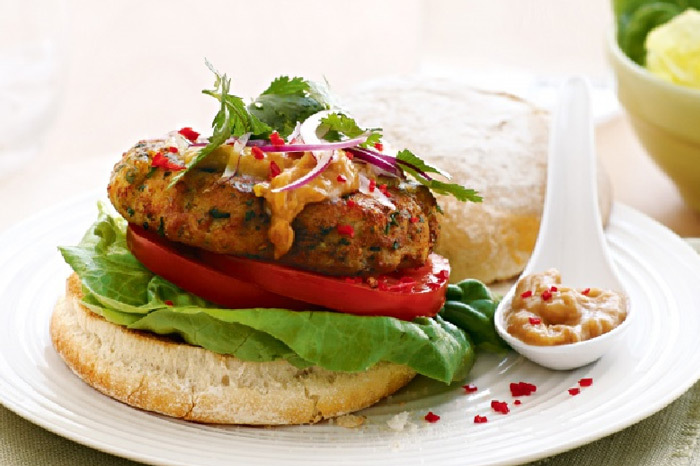 Fill the toasted burgers with lettuce, tomato, patties, onion, coriander, chilli and remaining satay sauce.